Polobubo Community Development | Truth always prevails.. Pause and imagine, the predicament of the people residing within the OML40 communities in the Niger Deta. If this is your community – where a private company (registered in Aberdeen Scotland) with five years tax exemption in Nigeria – daily operating and damaging the environment and socio-economic of the people who reside in this region. Eland Oil & Gas can not operate like this in any part of the United Kingdom without any corporate social responsibility to the people within the community they operate. They can not behave recklessly and arbitrarily without any consequences from the UK government. They are required to operate in a transparent and responsible manner with a clear business code of conduct and agreeable obligations to the UK government, local council and communities. In the Niger Delta region and Nigeria, they can get away with anything – they are actively and passively subjugating the people and milking the people natural resources daily without any corporate and social responsibility to the people in these communities. It is beyond shocking that Eland Oil & Gas and their cohorts do not pay their fair share of taxes either in Nigeria or United Kingdom. The damage caused by Shell Royal Dutch (Shell Nigeria) for over thirty-five years of operation and Eland Oil & Gas (Elcrest) to the people socio-economic and environment within the OML40 communities due to their aggressive oil exploration operations is unexplainable! This is my village where my ancestors and parents calls HOME! Go and find out how much the so called company “give back” to the communities where they operate. If Eland Oil & Gas and their various JVs are honouring the MoU they signed with the communities. Instead, they have adopted the “divide and rule” mechanism to subjugate, abuse the people and shut down any voice protesting about the predicament befalling the people and environment within the OML40 communities. This is a place where Eland Oil & Gas and their JV called Elcrest with the so called Sir Emeka Offor making thousands and millions of dollars daily and monthly. Do the calculations yourself – daily x $50 per barrel = No Corporate Social Responsibility (CSR)! Shell Royal Dutch Company came operated for over 35 years and left the place much more worst. Now it is Eland Oil & Gas Plc operating with these cohorts – Emeka Offor, George Maxwell & Co living large! Below the latest operational update report from the company posted in London Stock Exchange (LSE). Eland Oil & Gas PLC (AIM: ELA), an oil & gas development and exploration company operating in West Africa with an initial focus on Nigeria, is pleased to announce the following operational and funding update. Opuama is currently producing approximately 8,000 barrels of oil per day (“BOPD”), from the Opuama-3 well only, with export through shipping ongoing. Since the Company’s last announcement, approximately 120,000 barrels of oil have been delivered to the export terminal, with a further circa 40,000 to be injected imminently. Monetisation of this crude is expected to be in the region of $8.5million in the coming weeks. The previously announced borrowing base review of the Company’s Reserves Based Lending facility is complete and has resulted in a borrowing base amount confirmed at $24million. The redetermination was based on the production performance of Opuama-1 and Opuama-3, shipping export route and outlook. The Company expects to commence the side-track of Opuama-7 well by the end of H1 2017. Approximately a further $7million of capex is required for the completion of the Opuama-7 side-track, which is expected to add a further 6,000 gross barrels of production from OML 40. Following the successful side-track of Opuama-7, the Company will look to include this significant increase in production in its borrowing base and expects the headroom to increase accordingly to allow for further development funding for OML 40. The Company has a current cash balance of $7.5million of which, pursuant to the borrowing base redetermination, $0.8million is restricted to cover debt service. “The successful borrowing base review with our bank, Standard Chartered, ensures we are funded for our upcoming work programme at Opuama-7 which we expect to commence in the near term. Weare targeting bringing Opuama field’s gross production from Opuama-1, 3 and 7 up to 17,500 barrels of oil a day by early H2 2017. The people of Gbaramatu recount ordeal carried out by the Nigeria Army which should protect them. The Nigeria Amry invaded the community killed, raped, molested, brutalise the people in Gbaramatu community. We stand with the people of Gbaramatu Kingdom to unequivocal condemn the actions of the Nigeria Army – those responsible for these barbaric acts in Gbaramatu community will one day pay for their actions. The suffering and harassment of the people of Niger Delta region need to stop. Justice can’t be achieve in an atmosphere of intimidation and brutality. We are calling on the top leadership of the Nigeria Army and Minister of Defence to call on those Army assigned to the area to respect the human rights of the people of the region. Today, as people across Nigeria and outside both family, friends and foes bidding farewell to the late Governor General of Izon Nation Diepreye Solomon Peter Alamieyeseigha in his home town Amassoma in Bayelsa State. We join them likewise to bid this man who history and generations to come will remember – his life and story shall be spoken about in the market places, village squares, cities and countries (near and afar). As true blood Izon tribe sons and daughters, we want to join our voice to admonish the current Izon leaders and those coming behind the ranks that whatever you do, ensure (intrinsic) it is about human beings (lives) development and improvement. Don’t be sidetracked by the vanity of this life – don’t be disheartened when the wicked prosper – surely their end is destruction. We are aware there are many commentators will have a thing or two to say about this Izon Icon but this we know posterity is fair to all – his legacies shall speak either good or bad. We hope he made peace with his Creator and people. 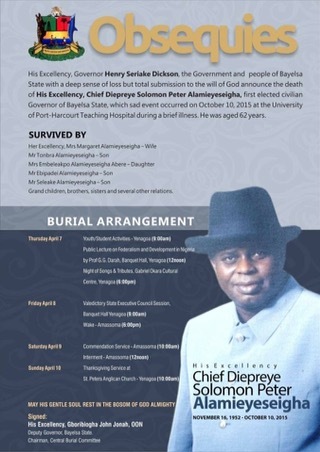 Adieu and Rest In Peace our Governor General Diepreye Solomon Peter Alamieyeseigha 16 November 1952 – 10 October 2015. May Spirit of God comfort those he left behind! These pictures captures the serenity of Polobubo. A place of peace and quietness for everyone to enjoy and be proud of. 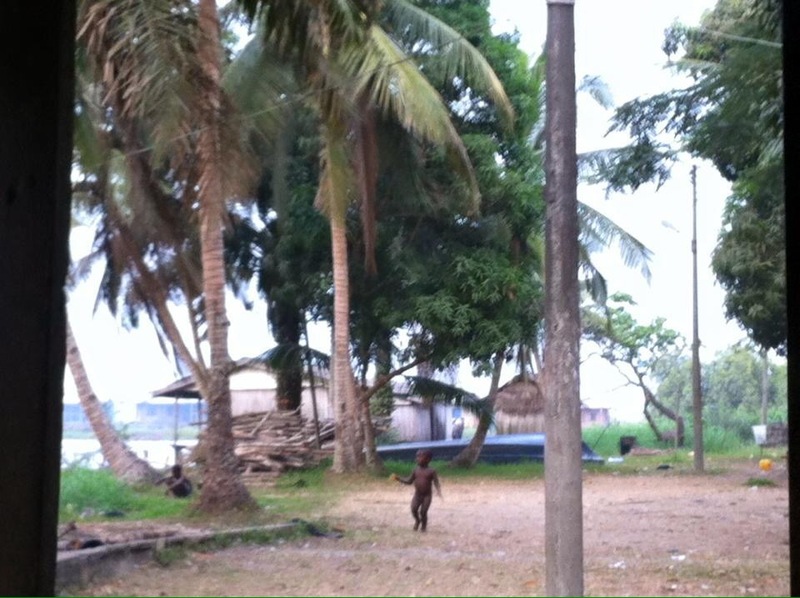 Today, Polobubo struggles with oil and gas pollution both water and air in the Niger Delta of Nigeria. We long for the day when Polobubo will come back to her true state for the dear people of Egbema kingdom. Long live Polobubo! Long live the people of Polobubo in Egbema kingdom. Thanks Bailade P Tiemo for the pictures. Chief Robert Ayeno Pablogba has lived a very interesting and eventful life. He is still exceptionally strong and virile at about 90 years and still struts with a youthful swagger and engages in activities that defies his age. Shortly before his 90th birthday, he sat down with S’South Regional Editor, Shola O’Neil and spoke about his growing up in the village, his journey from youth, late education, teaching career and the wisdom of managing a polygamous family. On growing up and the influence of Baptist missionaries. I was born in the village of Tsekelewu (Polobubo) about November 1927 to the Pablogba Okito Royal family of Olodiama, Warri North Local Government Area of today’s Delta state. I grew up with the tradition and custom of the Ijaw. We were so disciplined that our movement was restricted to the village and mostly in the compound. Our interactions were with different family members in the town of Polobubo. I did not know anything about education. We were able to get into the limelight of education when Nigerian Baptist Convention’s missionaries got to our village in 1938 and established a church at Tsekelewu (Polobubo). It was then that I came in contact with Rev. Omatsola and others, who taught us how to read and write and we were able to study the Bible. As we grew up, we came to understand that it is good to be educated. We were a little bit bigger than the school age but since it was a rural area, there was no age limit. 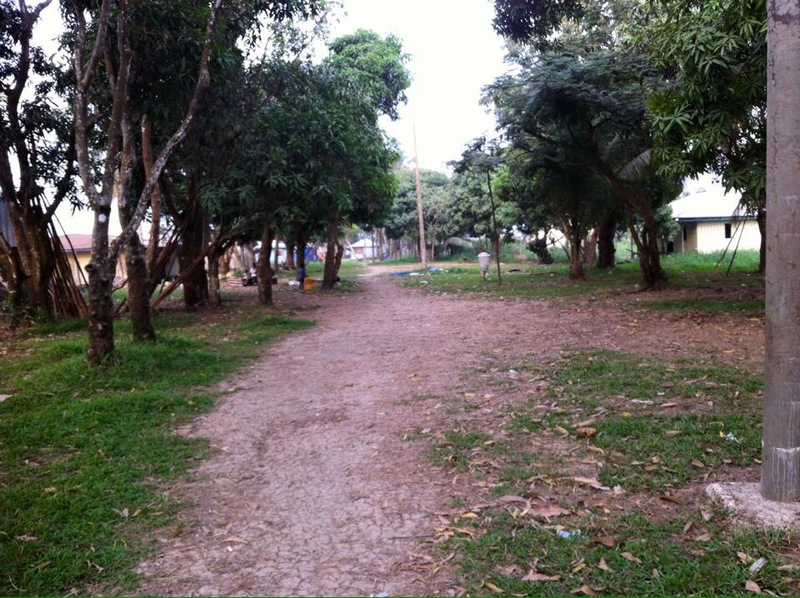 At that time primary school period was eight (8) years – Infant 1 and 2, then Standard 1 to 6. Because our village school stopped at Standard 4, we moved down to Sapele and then to Baptist School Aragba Gbekoba in 1947. I finished class 6 in 1948 (at the age of 21). I couldn’t have become a teacher (after Standard 6). That was the time Urhobo College, Effurun was started in 1948. I did and passed the exam but on getting to my parents at home, they had no money to sponsor me to secondary school. The alternative was to go to a teachers’ training and I was employed as a teacher by the Nigerian Baptist Convention. I started teaching in Tsekelewu Baptist School in 1949. I taught for two years and went to Baptist Elementary Teachers College in Benin City, did my Grade 3 Course and finished in December 1953. After the course, I was posted to Tsekelewu, where I taught for three years and later as the Headmaster of the school. In 1959, I was posted out of Tsekelewu to Ero-Abraka. I was Headmaster there for one year and later posted to Owerri Baptist School. But because there was lack of teachers in my village – non native teachers were finding it difficult to stay there – I was called back to the village. I taught there till 1965, when I went to Delta Teachers Training between January 1966 and 1967. I got my Grade 2 Teachers’ Certificate and was later deployed to Ogharafe Baptist School, where I taught for two years as Headmaster. Then, there was a complaint by teachers in the rural areas that teachers in the townships ought to be changed. For those of us who were in the township for many years, it was automatic for us to leave for rural areas. I was posted to Okwagbe Baptist School, which I headed for one year. Then those teachers in the rural areas, who had been complaining, found it difficult to stay in the township and they protested again. I was sent back to First Baptist School, Sapele in 1971 as one of the senior teachers. But there was need to further my education in order to enhance my pay. I went for an ACE course in Benin (1978 to 1979) to do Diploma. I was posted as one of the foundation teachers of Oriapele Grammar School (Sapele). Rupi was the Principal at that time and I was the Vice Principal. I was there for four years. Retired, but not tired. My incursion into politics. After 35 years as a teacher, it was incumbent on me to retire. So I was retired in 1984. Since I was still young, able and willing to work, I got an appointment as a Customary Court Member in Warri Area Customary Court in October 1988. We had two members, the central man, a trained lawyer, was president, and two others, including me. We were there until 1999 when the military gave up power. Politicians came and those of us who worked during the military era were relieved of our offices. So I joined politics. In Egbema clan, where I come from, I was one of the leaders who were elected. Sadly, if you are not in the ruling party, you are looked upon at as an enemy. But not minding that, we pushed ahead to see that the clan is in a good shape today in Warri North Local Government Area, where we have two principal tribes, the Itsekiris and Ijaws. Our struggle as one ward in the beginning has grown up to nine wards. We are seeing the progress and other things that are coming up. I think our community has been developed, our community is one of the communities that produce oil in Delta State which helped us into DESOPADEC and others and we have another global which is formed by two Ijaw communities; the Gbaramatu and Egbema axis that has brought development to the communities. Our boys have been employed to work there for a given number of years, either two or three years and later change them. Looking back, what’s your assessment of education today, and the future? If you look at the education we had then and now, there is a lot of difference because the standard of education is getting lower and lower. In our days, when you were able to complete Standard Six, you are equivalent to some graduates now. Now, some people see teaching as a means of livelihood, but other people like us who are very interested in educating others, educating our children, we took it as a full time job and we taught them to progress and go higher. The approach right now is that if you get to some rural areas, there are no benches, no building. Teachers find it difficult to go to the rural areas, saying they want to stay in the town. In the rural area, there are classrooms of six or more and you can only get one or two teachers who will go there because they want to survive. Many are rushing to the township to dwell, even when there is no job. Government has a lot to do. If you look at subjects like History, in the higher school, it is not there. If you don’t learn history, how will you know the origin of your people? There are so many subjects that are overlooked and those are the subjects that gave us the background to develop up to this level. Government must pay attention to infrastructure. You see pupils or students sitting on the floor, if the environment is not conducive, how do you think learning will progress? We need very good environment and teachers in the rural areas need adequate attention, better pay and other incentives, to do the job right. Government need to improve the quality of teachers and give them advance courses to grow. Parents on their part must care more; they should not allow the teachers to do it alone. Some parents do not have that zeal and appetite to give their children proper care. Parents, especially those in the township, are engaged in their businesses or professional pursuits. Some mothers do not even bath their children in the morning before they go to school. The child eats whatever they see and go to school. So the encouragement must start from the parents. Secrets to a happy, peaceful polygamous home? The secret of my strength and youthfulness even at 90 is God. I had three wives; the third one died around 2002 and the two wives you just saw. God has blessed us with 13 children. My grandchildren are over 40 and my great grandchildren are about six. Keeping the harmony in a polygamous home is difficult. Even a man who has a single wife has some problem compared to a polygamous home. It is a very difficult thing, which you must balance up by doing to A as you did to B. Like the children, if you decide to send two or three to the university from one family, same thing should apply to the other family. If not you will have no rest. The idea was to train those at the fore-front and if they successfully graduate, they would take care of their younger ones. Whether you are a monogamous man or polygamist, the extended family must be there. 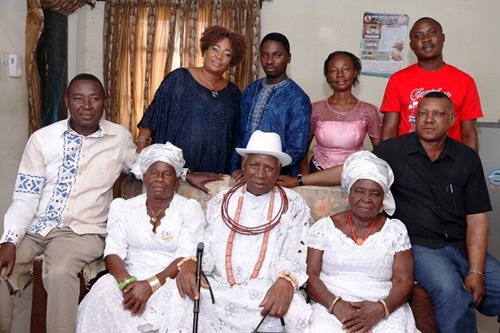 The extended family in the African tradition cannot be waved away. You have to bring them together and mix them up because you cannot cater for only your children; the family members will call you a witch, if you do that. That is the African way. I have been fortunate to have trained some members of my extended family who have become a blessing to me. This house you are seeing, my nephew (Mr Edmond Doyah-Tiemo) built it for me and he has been taking care of me. He is a blessing to me and I am very grateful for that. In my family there are some don’ts. I started to tell my children that everybody must go to secondary school and go higher. I wanted all my children to be graduates but it was not possible. I had over sixty percent (60%) who are graduates. Our children should strive to improve and meet up with the tide. Life is not easy you, there must be ups and downs. Most youths nowadays want to do white collar job (Oyibo work). To the young ones, I say ‘let’s do something with our hands.’ Learn handwork that will make you to survive. Now, you cannot get graduates who are willing to farm. They feel the education they got is for work in the office and using biro. Our young ones also want to be rich at all cost. You see a boy of 20, 30 years saying he wants to be a millionaire without work and doing unlawful things like bunkering, blowing up pipelines; but that will not take you anywhere. The only thing that can take you somewhere is learning handwork and not undermining anything. Government empowerment is not there because they will say we are going to empower but how many people shall we empower? Thanks to the South South Regional Editor of the The Nation Online.Net, Shola O’Neil. 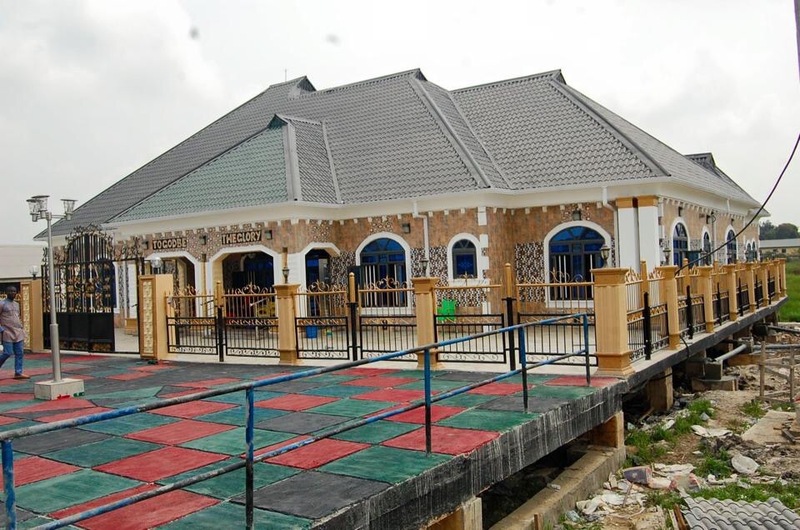 Polobubo (Tsekelewu) community is one of the ten Ijaw communities that made up the Egbema clan in Warri North, Delta State. It is situated in a boundary between Delta and Ondo state and is blessed with abundant deposits of crude oil within its environment. It is host to Chevron and Shell Petroleum Development Company since the 1970s. Apart from several oil wells and pipelines crisscrossing the environment, Shell’s Opuama Flow Station and Chevron’s Opuekeba Flow station that flare gas are located in the community environment. A third oil company, Sahara Energy has also concluded an Environmental Impact Assessment [EIA] with a view to operate at Polobubo (Tsekelewu) Marginal Field. ERA’s attention was recently drawn to the plight of Polobubo (Tsekelewu) people, as they have been forced to contend with the adverse impacts of canals constructed from the Atlantic Ocean by Shell and Chevron to access their oil facilities. These canals that were constructed in the early 1980s have adversely affected the ecosystem, poisoning water and vegetation and by extension, livelihoods. 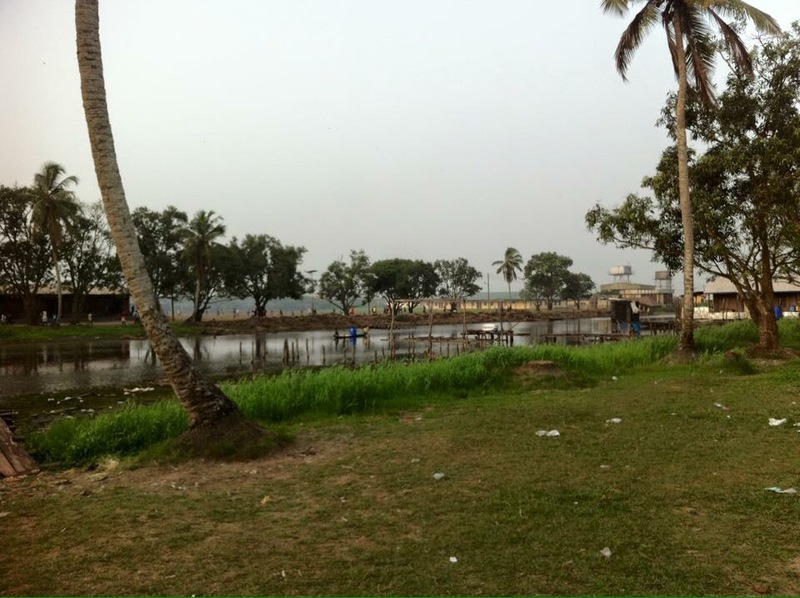 ERA monitor gathered that the Oloduwa Creek [the only access to the community], which used to be pure has now been polluted as the people can no longer drink from it any more. The people’s fishing activity has been so affected just like logging activities. These developments prompted ERA’s visit to the community 17th of January, 2011. ERA’s field monitors were led by an indigene, Mid-West E.K [Esq]. “The situation in my community is not just pathetic, it is really critical. It all started as a result of the canals constructed by Chevron and Shell from the Atlantic Ocean. 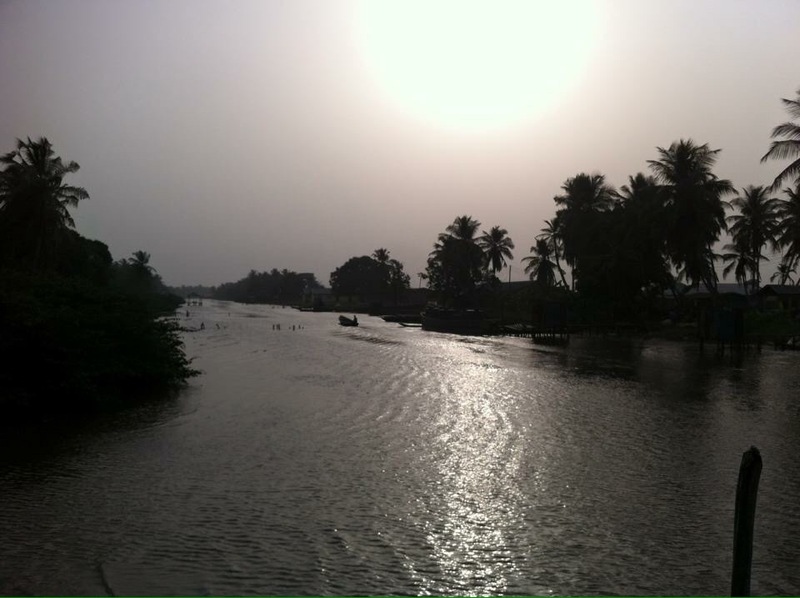 Our people used to drink directly from the Oloduwa Creek, because it was a fresh water environment. Before the canals that brought in salt water to destroy our environment, we had a sustainable environment; we supplied fish to other communities, tap palm wine from the raffia trees that were everywhere around us and also engaged in lots of logging activities. Then too, we used to have manatee in the creek because it was deep enough. The negative environmental and social impacts of the canals are enormous. The present scenario is that, we now have plants that are alien to us; which serves no economic purpose to my people when compared to the rich vegetation that existed before the canalization by the companies. ERA monitor observed that the negative impacts of the canalization in Polobubo (Tsekelewu) Community has caused grave economic, social and environmental hardships and is now beyond the capacity of the people to solve. ERA’s field monitors observed that, apart from the shallow Creek which affected the engine of the speedboat that was used during the field trip, large expanse of impacted land is now lying waste, with little or no trees in the environment, when compared to other communities. 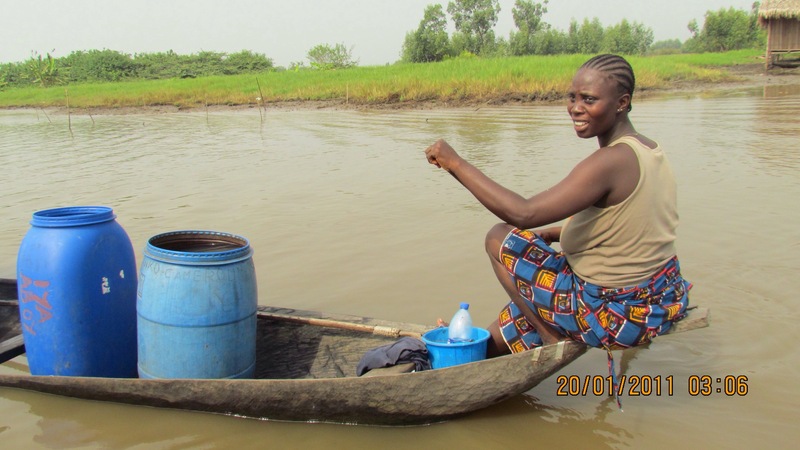 Indigenes were noticed returning conveying drums of water on canoe [from the oil company facilities away from the community], a very tasking activity for both men and women. The community is also in dire need of development as there is nothing to show for the oil wealth derived from the community environment. Some women and children were seen engaging in fishing activities. 1. The Federal and State governments compel Chevron and Shell take prompt steps to remediate the environment and compensate the people. 2. Chevron and Shell provide alternative source of drinking water for the community. 3. Shell and Chevron dialogue with the community to avoid violent conflicts as a result of their (oil companies) actions which have created problems for community folks. 4. The community seek legal redress to make Shell and Chevron accountable for their plight. Join the campaign #savePOLOBUBO #saveTSEKELEWU #saveOPUAMA on Twitter as we stand against Les Blair, Emeka Offor & their cohorts still abusing our people and degrading our environment each day. Let us not forget to campaign and calling the IOCs Shell & Chevron to give account of their over 30 years operation in our community and environment. This story by Emma Arubi from Vanguard Nigeria news clearly captures the deplorable state and fate of the communities in OML40. The environment pollution, degradation and health hazard to the Polobubo/Opuama community can’t be described unless you go there – assess and hear the suffering of the people! The #savePOLOBUBO #saveOPUAMA campaign objective is to campaign against the wickedness, expose and challenge the incompetence, ineptitude, corruption by these oil operators/companies such as Shell Nigeria – very soon Shell Nigeria will account for their retrospectively actions against the people and environment of OML 40. The current oil operators in OML 40 are Nigeria Petroleum Development Company (NPDC) and Elcrest E&P Nigeria Limited – is a joint venture by (eLand Oil & Gas Limited UK registered and based company) and Starcrest Energy Nigeria Limited owned by Emeka Offor are taking the people of OML 40 communities for granted and showing no ethical and moral obligations to the people and communities development – they think it is business as usual without any form of engagement with the host communities in OML 40. We are calling on eLand Oil & Gas Limited management team and investors to be aware that it won’t be business as usual in OML 40 – we the people of Polobubo/Opuama community will hold them accountable and responsible! It isn’t just moral and ethical for businesses to engage positively with the host communities they operate but it make good business and investment sense! 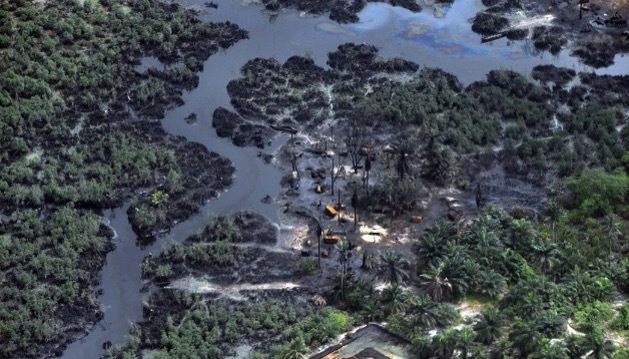 25 October 2014, Warri — OIL spills are a common phenomenon in the Niger Delta region. It could be caused by a third party interference popularly referred to as sabotage or equipment failure, a euphemism for failed pipes caused by either old age or the usage of sub-standard pipes whose integrity is too weak to withstand the continuous and permanent inflow of crude oil and gas. When these spills occur, it causes severe environmental pollution, degradation and health hazards to the communities and people. So it behooves on the relevant government authorities to take immediate remedial and urgent steps to curtail its spread and limit the negative impact on both domestic and aquatic life.